The Sandusky Lee TA3R362460-09 is a 20/22-gauge welded steel mobile cabinet with three adjustable shelves and a 180 lb. per shelf capacity suitable for storage. 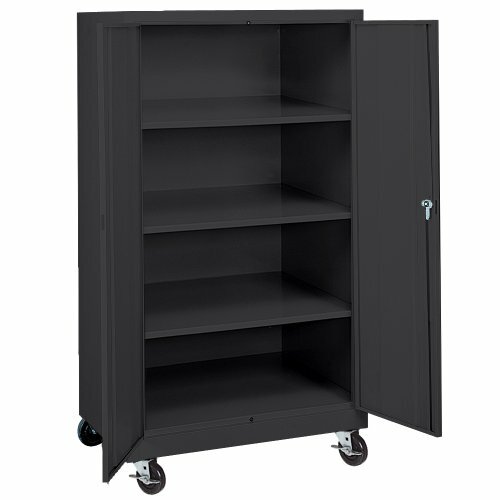 This mobile cabinet has one hinged door with a recessed locking handle and a three-point latching system with a door latch and two vertical rods to hold the top and bottom of the door shut for security. Two keys are included for the locks. The unit has 5 inch polypropylene casters that mount to a 12 gauge steel plate base for strength, maneuverability, and safe handling. The casters are mounted beneath the cabinet so that the unit can be positioned flush against a wall or similar flat vertical surface. The floor surface on this cabinet is raised and can be used as a fourth shelf. This unit has a black power coat to resist chipping and corrosion. The assembled cabinet including casters measures 66 x 36 x 24 inches (H x W x D). (H is height, the vertical distance from lowest to highest point; W is width, the horizontal distance from left to right; D is depth, the horizontal distance from front to back.) No assembly required.